Archive your mail in a comfortable place. Emails are still hard to find...after all these years. Offers new ways to find your email. CouchMail uses a small Python script which uses the Context.IO REST API to import emails into Apache CouchDB or IBM's Cloudant. Once the messages are in the database, they can be browsed by date (current) and are indexed by data, subject, who they're to, who sent them, who was CC'd, and (if you're using Cloudant) for full text search. Additionally, the full source of the email is kept (as an "attachment" in the original format) for use in legal matters where the original message (with all it's headers, etc) is required for validation. Time. There's never enough of the stuff. The Context.IO script took about 2 hours to write and most of that was learning which endpoints to use. More UI! 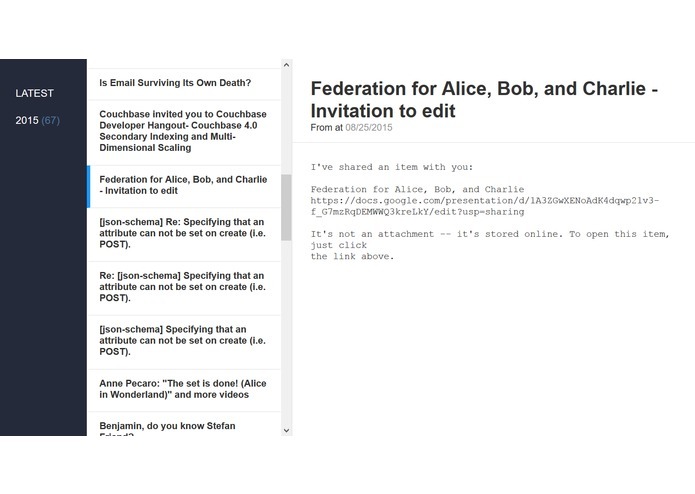 I'd like to browse my email archive by people's faces, places mentioned in the emails, semantic data (stored in schema.org actions, etc), and by tags, annotations, and notes I plan to provide via the UI on top of the emails I've archived. Think note taking, meets email. Inventor and evangelist building open source, open web, and open standard tech.